NOTE:- Lucky Patcher files comes in .zip file. Please download ES File Explorer from play store to open this zip file and install Lucky Patcher. To know about features and usage guide , please Continue reading. RECOMMENDED APP: With 9apps, you can download PAID apps and games for FREE. Get free in app purchases in android apps and games.Click Here to read in detail how to get free in app purchases with lucky patcher. PART 1: How to use lucky patcher apk in android? After downloading Lucky Patcher, Install it, open and grant root access. 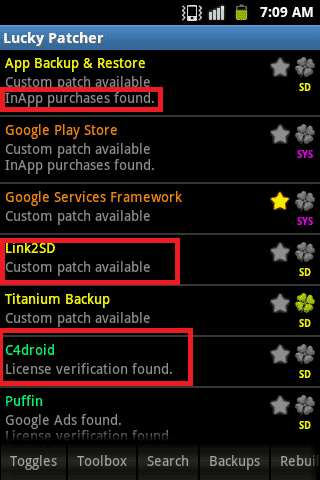 You can see “custom patch available”, “License verification found”, ” In app purchases found” below the name of apps. To get free in app purchases, please click here to read in detail. Look for the app or game that has “Custom patch available” below, then tap on it. Select Open menu of patches => custom patch. If multiple custom patches are available select any one of them. (You can try other if first one fails). Tap apply. Wait for some minutes until “Patches are applied” is seen. Congrats!!! If “Patch couldn’t be applied” message is displayed, Please upgrade or downgrade version of your app or game as said by lucky patcher to fix this. Please look screenshots below if you are still confused. Note:- Please keep lucky patcher installed in your device if you had applied custom patch to any app. Otherwise, the patch applied will be lost. To read How to remove License verification in detail with screenshots, click here. Click Open Menu of Patches => Remove Google Ads => Patch to remove Google Ads => Apply. PART 2: HOW TO USE LUCKY PATCHER ON WINDOWS 7/8/10? After downloading Lucky patcher, Download rooted bluestacks and install on it your PC/Laptop. You can search for rooted bluestacks on google. 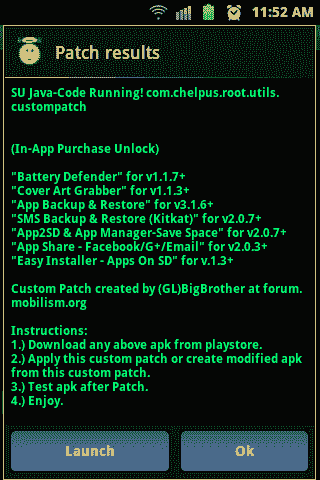 Now double click on .apk file of lucky patcher you downloaded before. Bluestacks window will appear and it will be installed. Now all the processes are same as you do in Android device. Enjoy. Q. Is it safe to use Lucky patcher apk file? Ans. Device safety: Till this date, there are more than 20 million users of Lucky patcher but there is no evidence that people got their device damaged because of lucky patcher. So, you will be 100% safe but you may still get errors about play store saying no internet connection but you can fix those issues. Ans. Though Lucky patcher supports many apps and games it is almost impossible to make it work on all the apps and games because every apps and games are different. They have different way of securing payment or prevent their app from modifying so the default system of modifying programs may work for some apps and fail for some others. Actually, it depends upon your luck that whether you get success or not, which is the reason to name this app as “Lucky” patcher. Moreover, it requires your skill to use this tool. There are many possibilities such as many modes are available for License verification, if you choose wisely, you will get success and to make wise decision you have to try a little bit harder. Q. 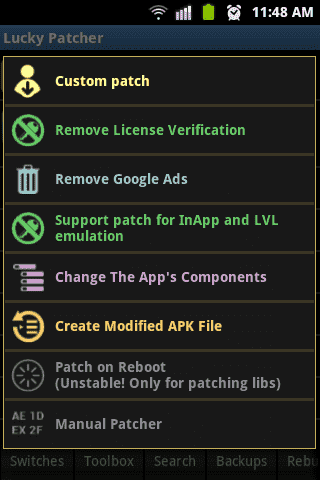 How does Lucky patcher apk work? Ans. Lucky patcher replaces the original code with new modified one and in some case it removes completely original code to get required features. Such as if you apply patch to remove License verification, it removes the part of the code that is written to check License from the app. Custom patch are made manually for each app and game. Bypassing License verification process is same for all cases but works only on 50% of cases, we cannot answer you why. Blocking ads actually works perfectly and is one of Lucky patcher feature that doesn’t depend on Luck. Q. I applied Custom patch but why does It say Patch Cannot be applied? Ans. Though “Custom patch available” is written below the app/game, sometimes patch cannot be applied because the app/game version you have installed on your device is different than the one for which the custom patch was made. Read the instructions carefully below “custom patch description” and upgrade/downgrade your app/game as required. Q. Google Chrome says “This file can be harmful”. Is Lucky patcher a virus? Ans. Chrome displays this message for every .apk file that you download. This is just an warning message, you can ignore it. Q. Why does Lucky patcher run slowly and Hang a lot? Ans. There can be two reasons. First one, your device is old and runs Android Gingerbread. If this is the conditions, all we can say is upgrade your device. Second one, Busybox is not properly installed or your superuser app is not good. Try installing SuperSU and busybox. Q.Is Lucky patcher available for IOS devices? Ans. Currently Lucky patcher is available for android only. Moreover, there is a much less chance that it will be available on IOS unless huge updates is brought to it which probably won’t happen. Q. Why this app gets so much updates? Ans. The apps and games for which the patches are made, get frequent updates, the patches will be outdated and we have to rebuild them. So, we have to update much frequently. Q.Modded play store is not opening/ Play store lost after installing modded play store. Ans. If play store is not opening and displaying “Force Close” message, try clearing data in your device’s settings. If play store has vanished from the app drawer, its because you installed unsupported Play store, try installing an older version.